Explorations in Quilting and Life: Winter is over at the Dahmen Barn! 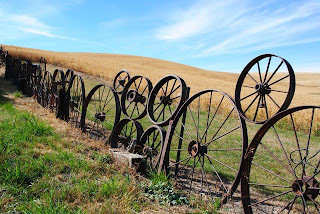 Last year I wrote a piece about visiting the Dahmen Barn in Washington State. It is a few hours south of Spokane and a lovely drive in good weather. The barn has been restored and housed exhibits and classes. I just received a note about a new glass exhibit there. 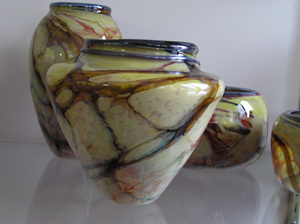 It is called Visual Organics and is an exhibit of glass by local artists Bob and Kathy Kernan. It opens Saturday, March 12 and runs through the 26th. If you are within driving distance, I think you will enjoy it. 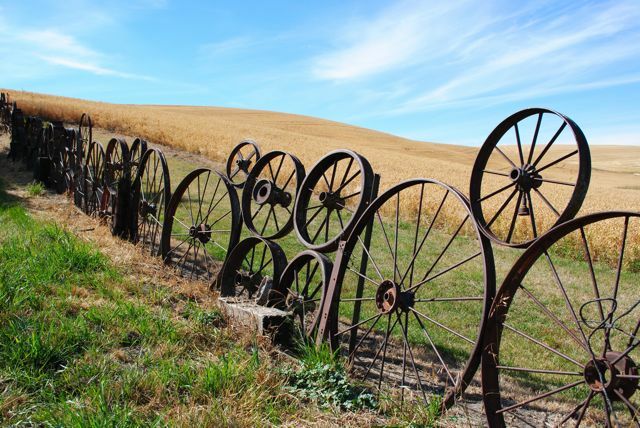 And, while you are there, you can snap a few photos of the famous Dahmen wagon wheels that line the property. They are sure to inspire you! Looks to be about a 12-hour drive from here -- without pit-stops, in good weather! Still, must keep it in mind if I ever venture down for a driving holiday. Thanks, Judy! The wagon wheel fence is so much fun! I have one wheel, should I start now? Thanks, Carol and Margaret. It would be a great add on to a summer drive Margaret. Thanks for the encouragement, Carol. I am off for a day of Bernina Club activities today - sure to be inspiring.